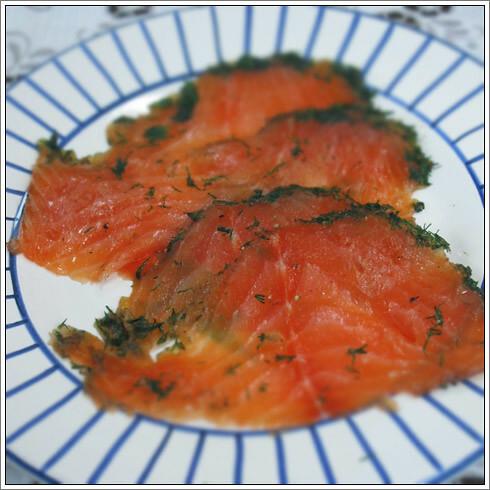 When I was a child, we used to have gravad lax as the starter every Christmas. Gradually, the tradition died out and was replaced with smoked salmon, which became the go-to each Christmas. I never complained - as a child, I was never quite convinced by gravad lax's strange, herby green crust and peculiar accompanying sauce. As this is my last Christmas as an unmarried woman and my fiancé is heading home to Ireland to see his family, my mother and I decided to go out with a bang. We brought back a morel-stuffed guinea fowl from France and many delicious canapés. We agreed that I would buy the smoked salmon, but rather than buy it, I thought I'd try making its Scandinavian cousin - gravad lax. 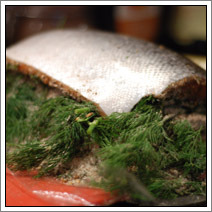 Gravad lax literally means "buried salmon", and rather than being smoked, it is cured in a mixture of salt, sugar, pepper, coriander and of course, dill. I did a trial run before attempting this one, and it is both very easy and well worth the effort. When you buy the salmon, make sure you get two similarly shaped pieces, ideally from the same fish. If you can, take your pieces from the middle of the fish, where they are as square as possible. Freeze the salmon for 24 hours and defrost before making this to kill off any parasites that may be in the fish. Begin by making the salt cure. 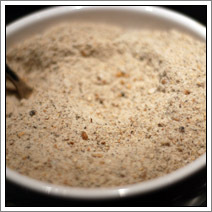 Put the salt, sugar, black pepper and coriander seeds in a blender and blitz until you have a reasonably even powder. I tried doing it by hand using a pestle and mortar the first time round, and trying to break up the peppercorns was remarkably ineffective. Next, finely chop about half the dill and set to one side for the moment. 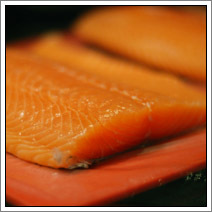 Cover a chopping board with cling film (keeping it attached to the roll) and lay the two salmon fillets side by side. Make sure you lay them thin to thick edge next to each other so when you flip one of them on top at the end, they slot together neatly. 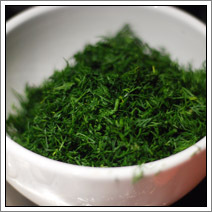 Divide the chopped dill between the two fillets, distributing evenly across both of them and pressing in firmly with your hands, then cover with the salt cure, again distributing evenly and pressing it in firmly. When you have used up all the cure, cover the side you intend to flip with a thick coating of dill sprigs from the remaining unchopped dill. 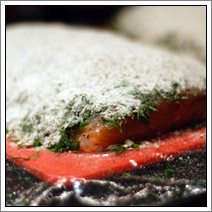 Flip the dill-covered salmon on top of the other piece - I used the cling film roll as a winch to flip the salmon over, which made it easier and less messy - then wrap tightly in several layers of cling film. 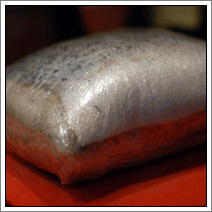 I went around three times in one direction, then wrapped it three times again to seal in the first layer's ends. 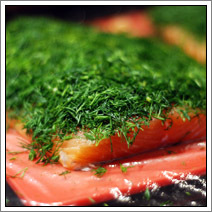 Place in the fridge for 2-3 days, then when it's ready to eat, brush off the cure and most of the dill and slice thinly on the diagonal using a salmon or ham knife. 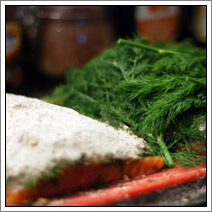 Serve with rye bread and the accompanying dill sauce. While the fish is curing, you can make the sauce - place the muscovado sugar, cider vinegar, honey, mustard and dill in a blender and blitz together. It will keep in the fridge for a week or so once made.